For many, the Schiavo case hinged on the right of individuals to control their own fates. But when it comes to extraordinary medical decisions and the ordinary business of living  the ideal of individual autonomy is not so simple. UNDERLYING ALL the bitter, emotional debate about Terri Schiavo is a fundamental set of questions about her autonomy: Did she, despite her severe brain injuries, have wishes, and would it have been possible to determine them? Were her prior wishes, apparently conveyed to her husband and legal guardian while she was of sound mind, rendered irrelevant by the uncertainty as to what ''she would have wanted'' after sustaining such severe injuries? These questions go to the heart of disputes like this one, where a patient has no living will or ''advance directive,'' but they extend even to cases in which people have made their wishes known by what most people would consider ''clear and compelling'' evidence. For it turns out that most peopleand most courtsfind it quite difficult to think about disability and autonomy at the same time. for about 10 years. Among the most important things we've learned in our journeys among people with disabilities is that the ideal of individual autonomy is far more complicated and elusive than it seems. On one hand, the ideal of autonomy is fundamental to any idea of democratic society. When we recognize and respect the sovereign and considered wishes of others, even when we do not agree with them, we accord other people a measure of human dignity; and when we express our own similarly considered wishes, we hope that we will be understood in turn, even if our desires aren't always fulfilled. Without autonomy, there is no human freedom, no human dignity to speak of. And everyone, it seems, champions greater autonomy for people with disabilities: liberals, because social justice demands as accessible a world as possible, a world that makes reasonable accommodation for everyone; conservatives, because greater autonomy for individuals with disabilities means less reliance on the mechanisms of the state; and libertarians, most obviously, because they insist on individual autonomy as the greatest good. But on the other hand, autonomy is vastly overrated. As philosopher Eva Kittay has argued, our culture's overemphasis on the ideal of autonomy makes it difficult for us to think clearly about dependency. More precisely, we tend to think of dependency as a sign of incompleteness, immaturity, and even moral failing; it is frequently associated with people who sponge off their relatives (or the state), people with nasty drug habits, people without the desire or the capacity to fend for themselves. When autonomy is the unquestioned ideal, dependency can only be an aberration or a scandal. The challenge for disability scholars and disability rights advocates, then, has been to try to convince their fellow humans that dependency is one of the incontrovertible facts of human lifenot only at the beginning and the end of life, when our dependencies are manifest, but every time we participate in large-scale forms of organization. Few among us, surely, pave their own roads, inspect their own meat, or build their own sewage systems. We are social and interdependent beings, which is to say that no one is truly autonomous, and in a culture that idealizes the ''self-made man,'' we have to keep reminding ourselves of that. For all of us, in other words, autonomy is at once indispensable and insufficient, and this is especially so for people with disabilities. 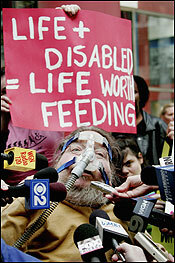 Without autonomy, the disability rights movement makes no sense: From its beginnings in the Bay Area in the late 1960s, disability activism in the United States has centered on the importance of individual autonomyand the moral imperative to alter physical and social environments so that people with disabilities can exercise that autonomy and participate more fully in the life of the nation. Ramps, kneeling buses, curb cuts, inclusive schooling, job coachesthese are not just social Band-Aids, but the stuff of democracy's utopian dreams: Another world is possible, a world in which all are valued. At the same time, however, there are any number of people with significant intellectual or physical disabilities who will never be fully autonomous; for such people, autonomy merely holds the scales in which they will be weighed and found wanting. And for such people, surely, some more supple measure of human dignity is required. The case of Terri Schiavo has provoked every kind of anxiety about autonomy. Some people simply fear the possibility that they may someday be as incapacitated as she was; others fear that they will be severely incapacitated without an ''advance directive'' that makes their wishes known; others fearpossibly with good reasonthat their advance directives will be set aside by authorities or activists who refuse to credit any patient's or family's refusal of treatment. Certainly, none of us hopes that our loved ones or our physicians will disagree vehemently about how to handle an end-of-life decision if we cannot make that decision ourselves; such decisions are always difficult and painful, and when family members are not in agreement with doctors or with each other, this disagreement raises the pain to the level of agony. In 2001, for instance, Robert Wendland died after 18 months in a coma and six years in a ''conscious incompetent'' state: He was seriously debilitated and unable to make decisions, but retained some awareness of his surroundings. He had been severely injured in a car crash in 1993, but despite his statements to his wife and his brother, prior to his injury, California courts ordered the reinsertion of his feeding tubeat the insistence of his mother and sister, against the wishes of his wife and his brotheruntil he eventually died of pneumonia. For her part, Rose testified that her husband ''made clear'' to her that under no circumstances would he want to live if he had to have diapers, if he had to have life support, if he had to be kept alive with a feeding tube or if he could not be a ''husband, father, provider.'' But this evidence of Robert Wendland's desires was deemed insufficient by the California Supreme Court, which decided that his wife had not provided ''clear and compelling'' testimony with respect to whether he would refuse medical care as a ''conscious incompetent'' patient. It's possible, as some disability advocates would argue, that before his injury Robert Wendlandlike many nondisabled peoplehad an inordinate fear of disability, and perhaps for him there was a strong link between disability and shattered masculinity. This is hardly surprising, given the pervasive stigma associated with disability. Furthermore, it's possible that even a person as severely incapacitated as Robert Wendland may come to change his way of thinking about life, or his life prospects. This is part of the problem with advance directives: People might, in fact, change their minds, and to entertain this possibility is only to respect their autonomy. But when their ''mindedness'' is precisely what's in question due to significant brain injury, then the problem of autonomy becomes impossibly complex. Disability rights groups filed amicus briefs to keep Robert Wendland alive, and they filed a similar brief in the Schiavo case. That brief, in addition to disputing the finding that Schiavo was in a ''persistent vegetative state,'' argued that Schiavo's previously expressed wishes, even if accurately described by her husband, were not binding because they were not made in light of the most current medical information about her condition. The disability groups' argument, like that of religious conservatives with whom they have little else in common, is that when a person's wishes are unclear (as they believe Ms. Schiavo's were), it is best to err on the side of maintaining medical care. They argue also more generally, and quite rightly, that we should work to destigmatize disability and that we should resist reductive, cost-benefit assessments of the value of human life. But there is another consideration here as well, which we believe is in keeping with the history of the disability rights movement: While we support adequate medical care for all persons with disabilities, we should not support legislation that will give governments the power to override the wishes of persons whose decisions about end-of-life care, for themselves or for their legal charges, happen to conflict with our own beliefs about disability. When Not Dead Yet attorney Max Lapertosa says, ''A judge's order to terminate the life of a woman with severe disabilities is not a private family matter,'' we sympathizebut we also fear that such a stance threatens to take end-of-life decisions out of the hands of families altogether, even when there is no dispute among family members. But whose ''choice'' is at issue here, and what constitutes ''coercion''? Would such a bill set aside even the clearly expressed wishes of individual persons, on the grounds that those persons were not thinking properly about disability? Once we begin deciding that other people's choices to refuse medical care are not really legitimate choices, either because they are clouded by prejudice, determined by circumstance, or twisted by ''false consciousness,'' we have abandoned the principles of democratic decision-making in favor of something else. The disability rights movement has done remarkable and inspiring work to enhance the lives, the autonomy, and the social status of persons with disabilities. And much more remains to be done, particularly in a country where 70 percent of people with disabilities are unemployed and so many lack even minimally adequate health care. We hope, then, that as this debate unfolds in Washington and in state legislatures, that our allies in the struggle for disability rights can find ways of supporting all the people who want and need life-sustaining medical care while respecting the wishes of those who refuse it. Michael Bérubé and Janet Lyon are professors of English and co-directors of the Disability Studies Program at Penn State University.